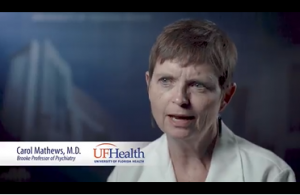 The University of Florida (UF) Department of Psychiatry provides a robust foundation of clinical care for the Mood Disorders Program and provides services across the UF and Shands hospital network, including inpatient and outpatient services, as well as intensive outpatient programs. We serve populations throughout Florida and the Southeast. Our outpatient clinics (providing adult, child/adolescent, medical psychology, and addiction services) are located in Gainesville and in Vero Beach. We provide adult, child, and geriatric inpatient services at our free-standing 80-bed psychiatric hospital, and have a medical/psychiatric specialty unit at the tertiary care hospital. The UF Department of Psychiatry’s consult-liaison program serves over 1,000 inpatient beds at our main UF Health hospital system. Furthermore, we serve those affected by mental illness and homelessness at the Sulzbacher Center in Jacksonville. The UF Department of Psychiatry also partners with the VA system, sharing full-time and adjunct faculty members and contributing to VA patient care. Our faculty and staff provide evidence-based individual and group psychotherapy (cognitive behavioral therapy, dialectal behavioral therapy, PCIT), medication management for all ages, neuromodulation (TMS, ECT, DBS), a pre- and perinatal mood and anxiety disorders assessment and treatment program, neuropsychological and educational testing, comprehensive sleep disorders clinic, pharmacogenetic testing (CLIA certified) for antidepressant response.